Pleated front. Color: Gray. 100% Cotton. Bottom Cuff. Navy blue. Pleated front. Cuffed hems. Clasp & Button Closure. 50% Poly 50% Rayon. 36 x 32 43 32 11 34. See photos for details about condition, and any flaws the item may have. 100% Cotton. Button Through Back Pockets. Hook & Button Closure. 100% Cotton. Button Through Back Pockets. Button Closure. 100% Polyester. Button Through Back Pockets. Hook & Button Closure. 100% Polyester. Pleated Front. Button Through Back Pockets. Hook & Button Closure. 100% Polyester. Flat Front. Loop Over Button Back Pockets. Hook Closure. = SIZE 36W X 34L = NEW. Savane Black Khaki Chino Pants. Pleated Front. Cuffed Leg. Teflon Stain Resistant. Flat Front. Loop Over Button Back Pockets. Hook & Button Closure. 100% Polyester. Flat Front. Button Through Back Pockets. Hook & Button Closure. 5 pocket, zipper fly, in excellent condition. They are "Dark Sapphire" colored! There are two front pockets and two back pockets with button closures! They have a button and zipper closure! They have a flat front and they feather a Comfort Waist for a Stretch Performance. New with tags, Savane eco-start Khaki. Men's 36x32 Pleated front. Permanent Crease, Wrinkle Resistant, Easy Care. Made with Recycled Materials, 60% Cotton and 40% Recycled Polyester. Machine wash and Tumble dry. Original Price $65.00 Returns only with tags attached please! Length 41"1/2. Waist ( laying flat from left to right) 18"1/2. 100% Polyester. Pleated Front. Button Through Back Pockets. Hook Closure. 100% Cotton. Pleated Front. Button Through Back Pockets. Hook Closure. Size 36W x 30L. Flat front. Batteries are not included. We do not support any warranties. Size: 36x34. Actual size: 36x34. It’s note: there are a couple of dark marks on the back of the pants. We have not tried cleaning. See pics for details. 100% Polyester. Color: Best described as a green-gray. NWT!! Men's Savane 36 Brown Dress Pants. Inseam 32. Inseam 32". Flat front. Leg openings 18" around. Cuffed Legs. Pleated Front. Size 36Wx34L. 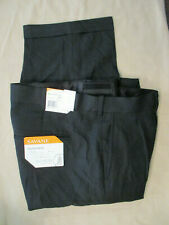 Savane no wrinkle Pleated charcoal slacks size 36 x 34. Pants are new with tags.